My Dad's 62nd Birthday cake! He loves to do daily crossword puzzles so I thought I would make him his own! The cake itself was a homemade dark chocolate fudge cake. The icing was a new cream cheese butter cream icing. It turned out wonderful and was so easy to make. 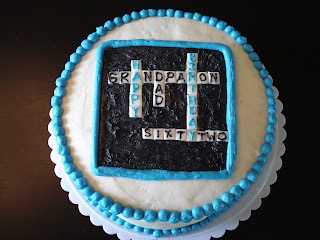 The crossword puzzle was created out of black icing and white bits of marshmallow fondant. Everyone at the party loved it and so did he!